If you're anything like my husband and still have yet to find the perfect Valentine's Day gift for the carrier, grower and bearer of your adorable genetic material, let me propose 6 simple yet amazing gift ideas for you. For Valentine's Day we tend to keep things pretty simple around these parts and by simple we're talking flowers, chocolates and love letters from my husband and three sons. While I really do love each of those things, I can't say that I would hate it if a much larger, romantic production or, say, a limitless shopping spree and spa day was sprung on me. The sole fact that you, the reader, is even here, checking out this gift guide, speaks volumes. It shows you care and want to surprise that special mom in your life with something that lets her know she's on your mind. And that's pretty awesome. What's even better is that this kind of gift guide is also great for birthdays, Mother's Day and yes, even that random Wednesday when you may or may not need to say "I'm sorry." Think of things moms like and then buy them lots of that stuff. I'll give you some hints: moms like quiet things, sparkly things, things they can do by themselves, for themselves and even eat themselves without their children begging for bites. Things that make her feel extra special. Pretty things. Things that smell nice. Things moms don't like: underwear that doesn't have a crotch or looks like a doily that takes thirteen minutes to climb into and out of and homemade "coupons" for "free massages" that leave her wondering just who that gift was intended for in the first place. Things that require her to feed and water them in addition to her small children. Just saying.. Being a mom isn't the nicest smelling profession. Between the diapers, the sports equipment and the rotten milk sippies found in the darnedest of places, being a mom STINKS sometimes. Do you know what doesn't stink? This amazing Capri Blue Volcano Candle. As an avid F-word user, this is a Mug I wouldn't mind drinking my thrice-reheated morning coffee from. How f*&^ing fantastic is that? Even though we moms may not want to spend every waking moment with our darling children, the truth is we would love to wear them everywhere we go and show them off to complete strangers at Target and the grocery store. This custom Necklace from the Miracle Links line at Kay Jewelers is the perfect piece to do just that. Champagne. Need I say more? And yes, spring for the fancy kind, especially if she's a fan of the bubbly. Being an adult isn't all it's cracked up to be especially when it comes to getting the mail every day. Bills, bills, bills and the occasional registration packet for pre-school can leave a mom feeling down in the dumps. But when mail includes, say, a Subscription Box, you just might find her skipping down the driveway! I don't know what it is about being a mom (yes, yes I do) but clothes never fit the same after having babies. Furthermore, going clothes shopping isn't always the party it once was. Do you want to know what always fits great after having a baby, provided you know the right size to buy? Shoes. And these Flats never disappoint. Not to mention that they're one thing that can't be ruined by spit-up or stray peanut butter laden fingers. 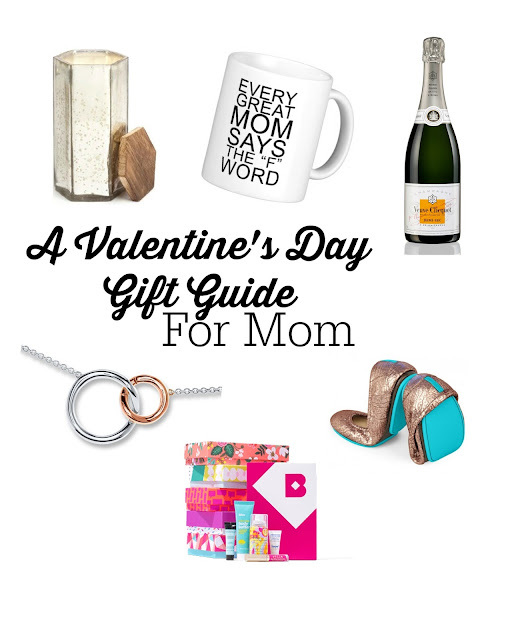 Now go on, check out these ideas and I know you'll find the perfect gift for her! Happy Shopping!